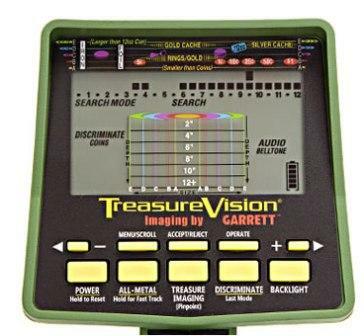 The Garrett GTI 2500 metal detector is the premium metal detector from garret. The GTI stands for Graphic Target Imaging as this is a metal detectors that shows depth as well as the size of the metal you have found before your start digging. A top way to avoid cans and other trash and go for the high value targets. Along with a multitude of top features like the graphic target analyzer telling you the type of metal you have found on a whopping long discrimination scale, this metal detector provides the user with more information to make a dig decision than any other on the scene. Coupled with a Digital Signal processor the Garrett GTI 2500 metal detector has a very powerful head on its shoulders. Scantrack that automatically adjusts to your swing speed to pick up signals perfectly everytime. Salt elimination for hunting on the beach. Surface elimination for hunting trashy areas. GTI – Graphic Target Imaging to show size and depth of the target. Scantrack – to optimize for your swing speed. Automatic ground balance function for mineralized soil. Power master circuitry for 20% more depth. Manual discrimination options in the Graphic Target Analyzer. LCD backlight for night hunting. Standard 9.5 inch proformance coil. 1.01 m – 1.29 m length. 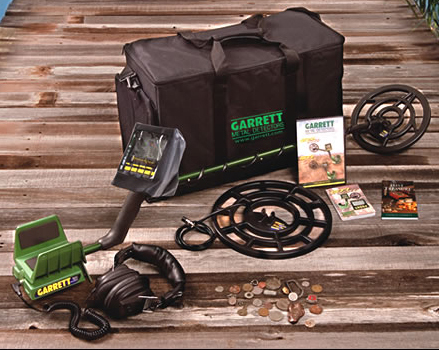 Get the Garrett GTI 2500 Metal detector pro package for a top price. Order here. With this package you will get the Garrett GTI 2500 with 9.5 inch coil plus a large 12.5 inch coil, GTI case, Deluxe headphones, Environmental cover up, how to find lost treasure field guide. Get the GTI 2500 metal detector with treasure hound. The Treasure hound is a depth multiplier package that allows you to search 2x – 3x the depth on larger targets. Essentially this is a depth multiplying search coil. GTi 2500 customer review park and relics. GTI 2500 Ocean / Surf hunting. The GTI2500 is a great machine!